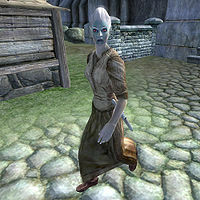 Myvryna Arano is a Dunmer agent who lives in the Waterfront District of the Imperial City. After you have been to jail she will travel throughout Cyrodiil to find you and deliver your invitation to join the Thieves Guild. Later during the quest The Elven Maiden you find out that she is actually a mole hired by Hieronymus Lex to infiltrate the ranks of the Thieves Guild. Once her cover has been blown Lex arrests her, despite her loyalty. After The Elven Maiden you can visit her in the Imperial Prison. Oddly, she does not switch to prisoner clothes, and even more oddly, they let her keep her dagger. She wears a set of lower-class clothing: a coarse linen shirt, coarse linens, and a pair of stitched leather shoes. She is armed with a silver dagger, a key to her house (mistitled 'Barash House Key'), and a small amount of gold. She may also have the mysterious note in her inventory. She knows the standard leveled Agent spells. The first time you speak to Myvryna Arano she will greet you by saying: "I'm Myvryna Arano. I... persuade people." Asking her about the Imperial City will have her reply: "People in the city, they get stuff and forget to pay. So I help 'em remember. You talk to 'em, lean on 'em a bit, and they remember right away." If you are sent to jail, after you get out of jail, you will be approached by Myvryna, who will give you a note after saying: "Take this. It's from a friend." Speaking to her again after she gives you the note will have her claim that she is too busy to speak with you: "I don't have time to talk." Despite this, she will allow you to question her about the mysterious note she gave you. Asking her about the note will have her deny any knowledge of its contents: "Hey, I don't read them. I just deliver them." Uzul gro-Grulam, Myvryna's house mate, expresses ambitions of marrying her, introducing himself as: "Uzul gro-Grulam. I'm courting Myvryna Arano, so stay away from her. I got matrimony on my mind." Speaking to Myvryna Arano during the related quest will have her greet you with a considerably hostile demeanor: "What do you want?" Asking her about the bust that you need to steal will have her suspiciously claim to be unaware of what you are talking about: "Bust? What bust? I didn't overhear any conversation about a bust." Planting the bust of Lady Llathasa Indarys in a cabinet in Myvryna Arano's shack, and then claiming that Myvryna Arano stole the bust to Hieronymus Lex will have him search her house. When he discovers the bust Lex will confront her by saying: "This citizen is accusing you of stealing the bust of Llathasa from Cheydinhal. I even found the bust in your cabinet. What do you have to say?" Myvryna will reply by (rightfully) accusing you of stealing the bust instead: "Fool! You've just exposed me to the Thieves Guild. That "citizen" is actually the guild member that was hired to do the theft!" Lex will reply by stating that even if her accusation was correct it would mean that she has been compromised, and is therefore useless: "Regrettably I've no further use for you. If what I heard is true, you're the thief. If what you say is true, the Gray Fox knows you are my informant. Either way, it's over. You didn't really think I'd trust the likes of you for very long?" Myvryna Arano will then beg for Lex to show her mercy: "But I've been loyal to you! I've reported everything that Armand has done. You can't just toss me aside like a soiled cloth!" Lex will ignore her pleas and arrest her after saying: "Yes I can. You are under arrest for the theft of the bust of Llathasa Indarys, Countess of Cheydinhal. Come with me." If you follow Myvryna and Hieronymus Lex after he arrests her, they walk to the Bastion and she goes to the right-side cell block; if you later break into that cell block, she will be locked in the first cell. The Elven Maiden: Steal a statuette for a mystery buyer. There are two other Dunmer NPCs with the surname "Arano" (Tanasa Arano and Mivryna Arano), although there is no evidence that they are related. During the Untaxing the Poor quest, the Waterfront Tax Records note her as being "exempted" from the taxes, foreshadowing the future revelation that she is a mole. This page was last modified on 31 January 2018, at 23:14.